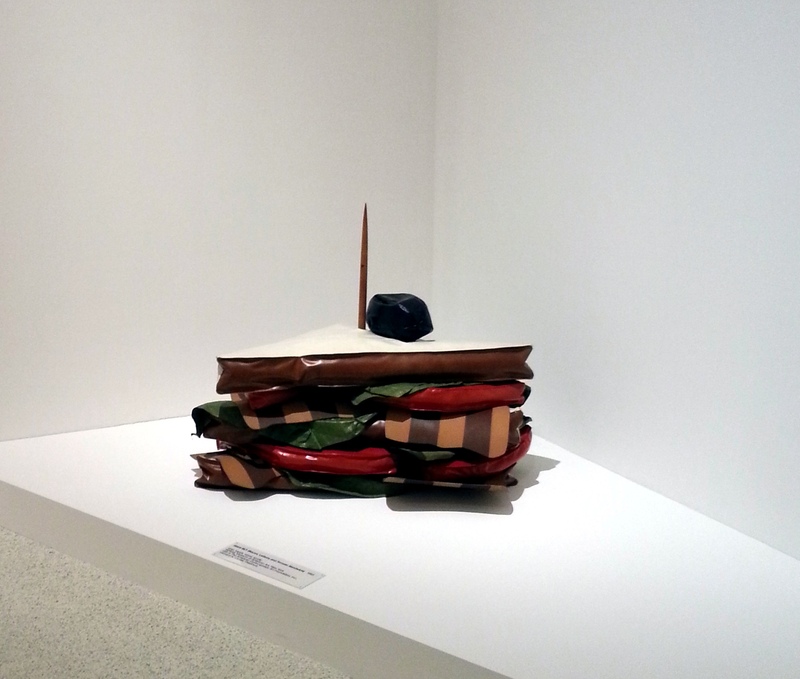 The week before last, I got to check out the Claes Oldenburg exhibit at the Walker Art Center in Minneapolis. 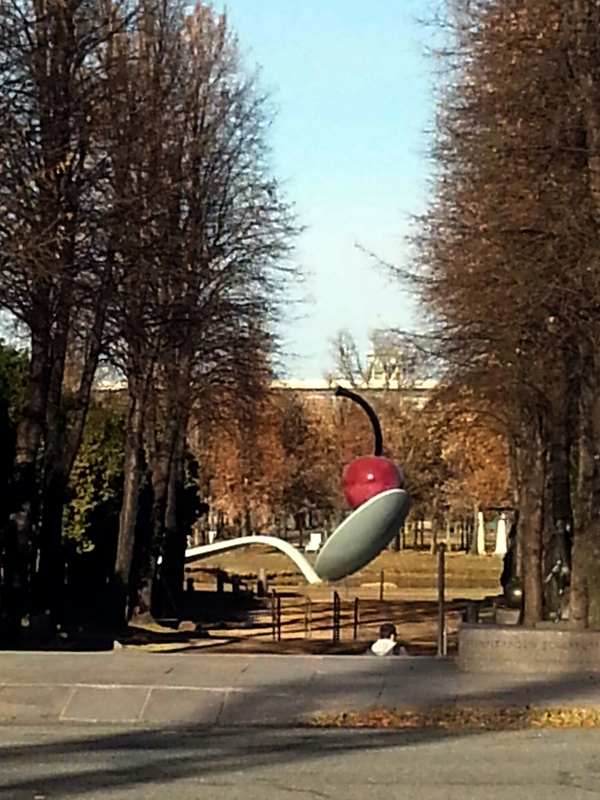 I have seen the iconic “Spoonbridge & Cherry” a few times in the sculpture park outside the museum – it has become a symbol of the city’s contemporary art culture. 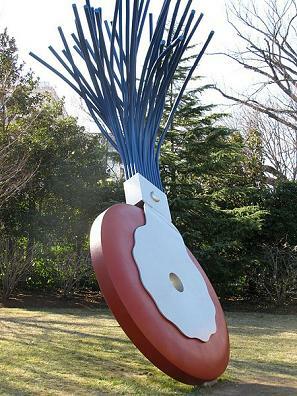 When I think about it, I guess I have seen a fair number of his oversized, highly-polished sculptures of everyday objects. 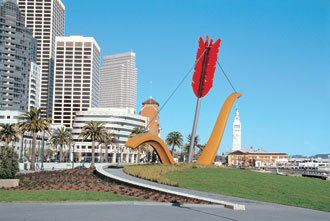 I have been amused by the large typewriter erasers, umbrellas, the bow & arrow in San Francisco’s Embarcadero, a broom & dust pan, shuttlecock, etc. Most of those public works have been created since the 70s. 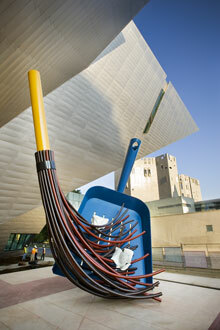 The focus of the show at The Walker is on the art he produced right after he moved to NYC that was created in the 60s. While I guess I understood he was part of the movement from AbEx to Pop, I really have never known that much about his earlier works. 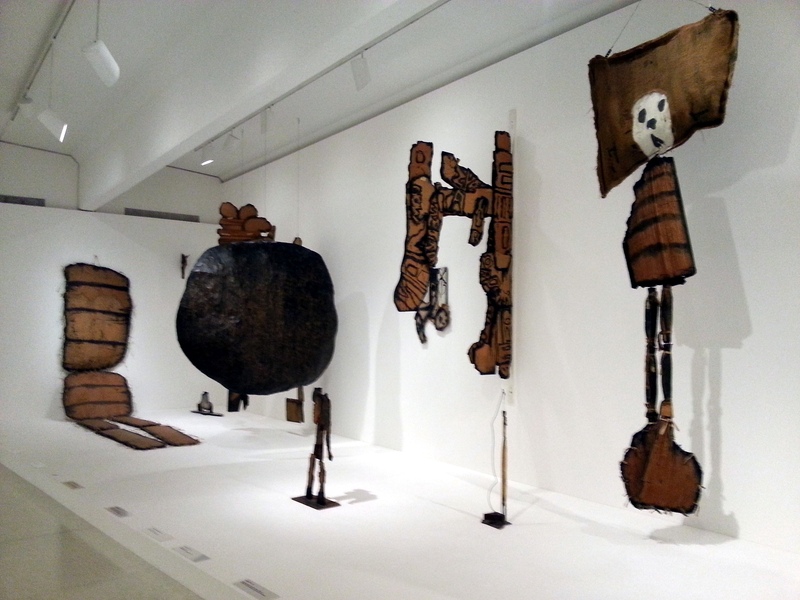 Pieces from his first show, “The Street” depict the urban grit of the city and were made from bits of cardboard and materials that he would have actually picked up from the street. About this same time he was experimenting with live performances and participatory art “happenings.” These interactive art performances were kind of a combination of performance art, flash mob and improv. These performances called for soft sculptures that he and other participants could interact with.. handle, move and even wear. 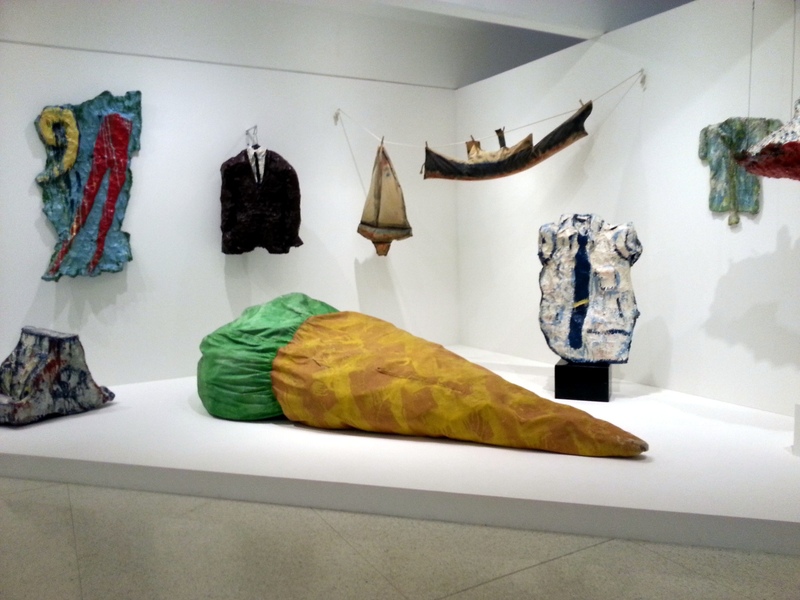 When his show ” The Store” was re-designed for a larger gallery, he adjusted the size of the sculptures to fit into the space. 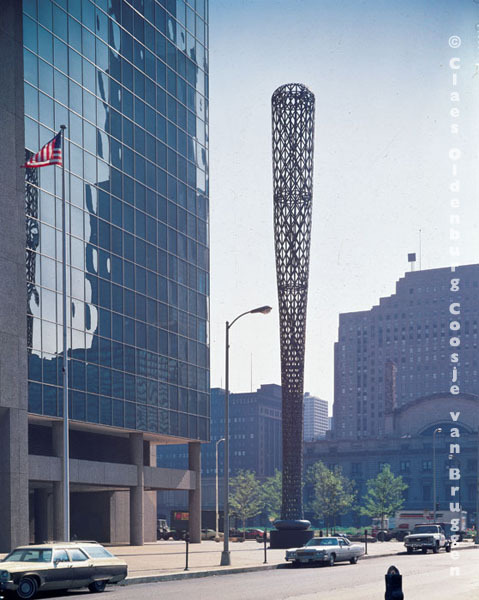 This was key to all of the subsequent work – his fascination with common, everyday objects, unexpected materials and scale have lasted throughout his career as an artist spanning more than 50 years. The show includes key pieces from “the Home”: light switches, toilets, electrical sockets, etc. 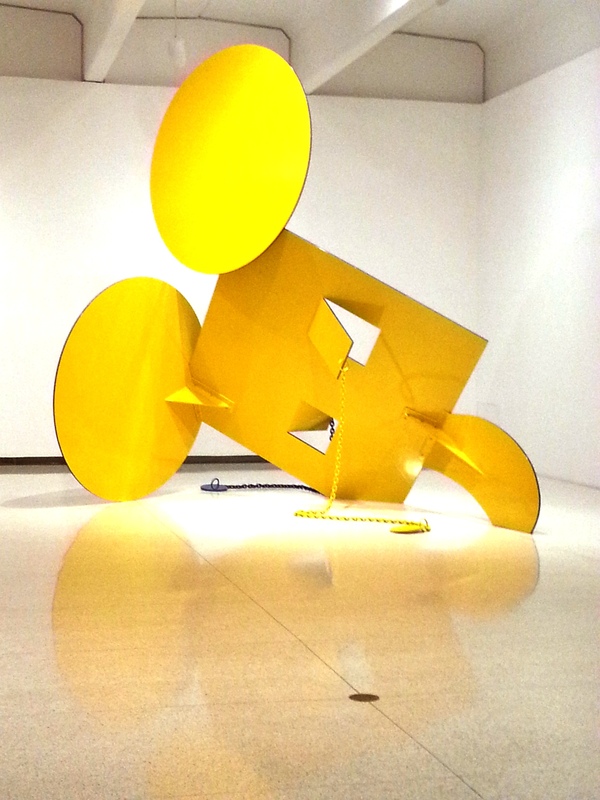 The geometric mouse is shown in a number of iterations – both as sketches and sculpture. 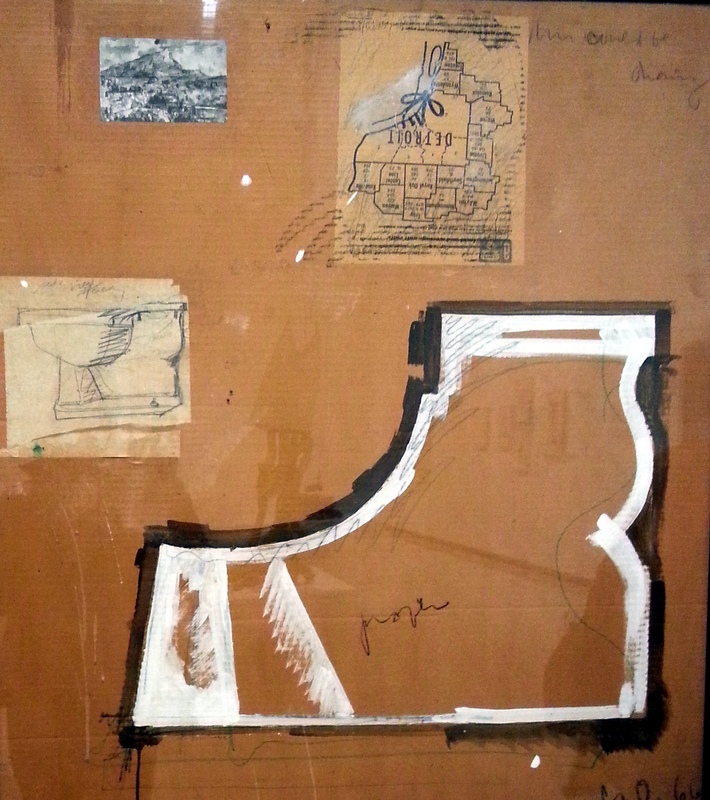 Of course, Oldenburg is known for his Pop Art sculptures, but he has always maintained an active drawing practice and so the show does dedicate a lot of space to showing his sketches and watercolors – for him that is the begining of all art. I was particularly interested in his proposed architecture and monuments – the MetLife building as a giant Good Humor bar and giant banana for 42nd Street. The show brings together nearly 300 pieces from around the world – it’s well put together and thoughful; really I think it is the perfect primer for anyone that has ever wondered about the guy whose made his career making those giant sculptures that seem to always make us smile. I LOVE IT!!! This entry was posted in Art, Art Collecting, Contemporary Art and tagged art by Mike McClung, art collecting, art consulting, ArtLook, Claes Oldenburg, Claes Oldenburg The Sixties, Contemporary Art, Denver Art Consultant, Denver art consulting, individual art consulting, Mike McClung art, my art look, my artlook, residential art consulting, Walker Art Center by mlmcclung. Bookmark the permalink.